NISOD 2018 | Mark H. Kavanaugh, Ph.D.
May 26, 2018 to May 29, 2018 in Austin, TX. This was an excellent experience. 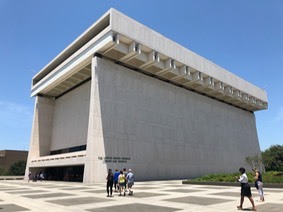 �Anyone interested in civil rights, pell grants, National Parks, Head Star, TRiO,�the War on Poverty, Medicaid and Medicare, and all the other types of legislation that came out of this era would love to visit this museum/library. 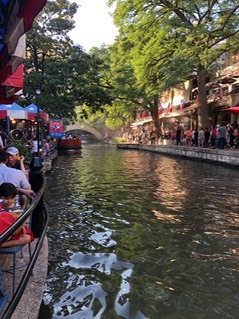 The next trip was to San Antonio (including the Alamo). �Much fun was had by all. �The Alamo was cool but the riverfront district was the rage! On the first day of the confrenence there was an opportunity to post a selfie to the #NISOD2018 on Twitter. �People who did so would be randomly selected for prizes. I won a coupon that pays for next year's NISOD conference fee! First-time attendees at the confrence were urged to particiapte in a special seminar. �This seminar introduced us to the NISOD organization and general expectations and structure of the conference. According to their website, NISOD is "a membership organization committed to promoting and celebrating excellence in teaching, learning, and leadership at community and technical colleges." Check out the membership benefits (including conferences, awards, trainings, webinars, regional offerings, etc.) �KVCC may well want to become a member of this organization! "We all are teachers, we all are learners." �This session is titled after a book by Donald Finkel, "Teaching with your Mouth Shut". �The focus is on why teachers should talk less so studnets are more engaged and learn more. �Participants expereince the session as studnets and share feedback during and after th activities. �Particpants leave with at least five new engagement strategies they can immediately apply in their classrooms." Suggests using the app called "Padlet"...an app for posting comments and questions live in the classroom. Activity #1 - Showed pictures in nature. �Had us come up with how to explain something related to our expertise using the picture. �She used a lot of nature pictures for this. �The group came up with a lot of analogies and such that were very creative. Select the right textbook (she suggests using OEM and specifically outlined the use of OpenStax. Creating critical open-ended questions from the text. Pulling quotes and graphics from the text to use in class. Making connections to text, going deeper. 2-minute reflections - what was learned before class (reading) and what was learned after class. Activity #3 - Groups need to be structured. �Groups will work in a classroom as long as you have good instructions and roles. Make sure group is "intentional". To practice this we were given bags with objects in them and had to come up with a topic lesson using the object. �This was actually very powerful. "Many students are first-genration college studnts who have not been exposed to the benefits of education, including how it can lead to enjoyable, meaningful careers. �This sesson shares how New Mexico State University - Alamogordo developed a Wildlife and Fisheries course in which students experience service-learning projects and receive internships. �Recommended methods to ensure that student-learning objectives are met through experiential learning are covered, as is the supporting research." I actually met Dr. Smith in the previous session and through our conversation, she invited me to co-present with her on the topic of Service-Learning. �Her program is grant funded and provides funds to pay students to engage with researchers in conservation and wildlife research as part of her class. �She is the only person to do Service-Learning on the campus. My contribution was to discuss the devleopment of a culture of Service-Learning on a reluctant campus, how to build upon individual faculty passion, and the resources available through Campus Compact. This roundtable presentation was also attended by another "Director of Service-Learning" so the discussion was rich and anecdotal. "On many�campuses, faculty professional development coordinators and librarians share similar responsibilities - providing access to resources, facilitating learning, and supporting the pursuit of�knowledge. �What avenues open for faculty members when the faculty professional development coordinator is a librarian. �View facuty development through the lens of critical library pedagogy, discuss how 21st century literacies can inform practice, and identify opportunities for collaboration between academic libraries and teaching and learning centers during this lively and interactive session." Why do we ask students to use peer reviewed articles? How do we conceptualize valuations resources? "Beer with the Librarians" event every week! - topics include citations, satire, critical thinking, etc. Landscape of Practice (shared with Faculty) - we have our specialties, our interactions with others in the community, personal experiences, technology, language, jargon, etc. Promoted the Library as a CENTER of student and college identity. �They even give out the ID cards to focus on this role. Great session on the match between the critical skills that librarians possess and the needs for Faculty Development. "This session addresses the concept and research that support using High-Impact Practices (HIP) to assist students to become successful learners. �We start by discussing what HIPs are, followed by sharing research that supports these activities. �We then discuss how HIPs help students and the college. �We finish with a discussion about the HIPs adopted by our psychology department." This session reviewed what I though could be better termed as Middle-Impact Practices. �These included projects on specific diagnoses and treatment, community-based resources, and general topical research activities. The data is still coming in on how this has impacted learning. �The study divided all their sections of Introduciton to Psychology (over 50 of them) into an experimental group (having HIPs) and control (those withouth HIPs). This sesson was led by Mark Kavanaugh, Professor,�Kennebec Valley Community College. "During this roundtable discussion, participatns explore how an Introduction to Psychology class provides an ideal platform for exploring, teaching, and assessing general education learning outcomes. �Using the signature assignment model, participatns discuss how this course can help studnets madter general education skills early in their college careers. �THe work developed by particpatns during the session will be ublished in a follow-up e-book." Lots of discussion focused on how to facilitate the standardizaton of specific expectations in a class across a number of different course sections taught by different professors. Here is a link to a list of the different assignments (organized by VALUE Rubric titles) that I have developed. �This list was distributed to all the attendees. Here is a link to the handout that I provided each attendee. This sesson was led by David Katz III, Executive Director, Mowhawk Valley Community College. "Whether in a classroom, team room, meeting room, or boardroom, we all have a desire to maximize the potential for out communications to be memorable, meaningful, engaging, and inspiring. �This fun, highly-interactive, and multidimensional learning experience models the elements that make up compelling communication. �Learn how to engage listeners adn motivate them into action, reflection, and postive development when you speak to any size group!" I actually sat with David on the plane from Phillidelphia to Austin! �This was the most amazing presentation of the conference. 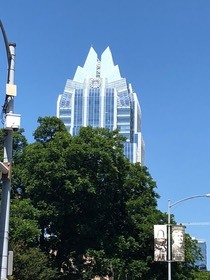 I connected with David's entire team from Mowhawk Valley as we adventured into the city for dinner and to watch the famous bats come out from underneath the Congress Avenue Bridge. David would be an excellent speaker/trainer to bring to KVCC.